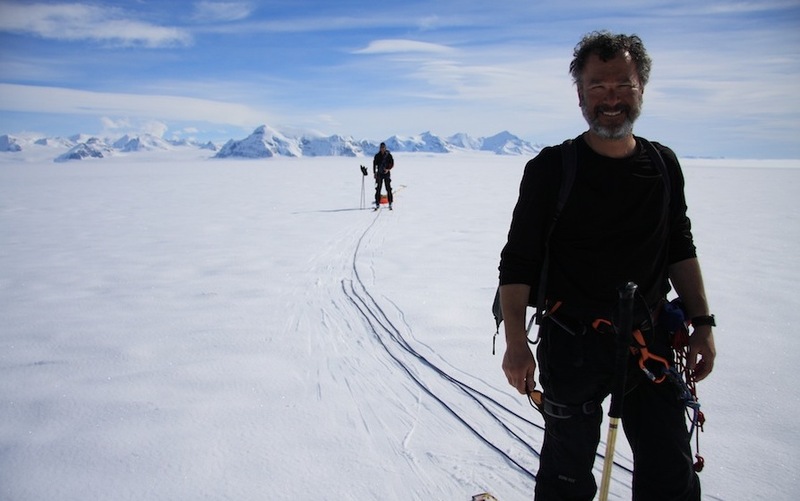 Ted Scambos skis across Scar Inlet on the Antarctic Peninsula, during a 2009-2010 field expedition to study changing glaciers in the region. 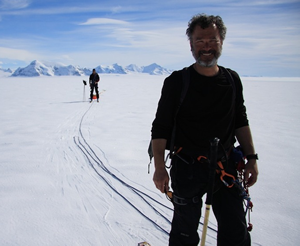 NSIDC Lead Scientist and Antarctic expert Ted Scambos will join a panel of scientists on December 15 at 9:00 a.m. Pacific Standard Time for a press briefing on changes on the Antarctic Ice Sheet. Please see below for call-in information for reporters not attending the Fall American Geophysical Union (AGU) Conference. Please visit the AGU Web site for more information: https://www.agu.org/meetings/fm10/newsmedia/index.php. Unstable Antarctica: What's Driving Ice Loss? New results based on data from airborne and satellite missions show a clear picture of mechanisms driving ice loss in West Antarctica. Scientists have previously shown that West Antarctica is losing ice, but how that ice is lost remained unclear. Now, using data from a range of NASA's Earth observing satellites and from the ongoing Operation IceBridge airborne mission, scientists have pinpointed ice loss culprits above and below the ice. Continued monitoring of Antarctica's rapidly changing areas is expected to improve predictions of sea level rise. For more information on the day of the briefing, visit the NASA Web site at https://www.nasa.gov/topics/earth/agu/nasa-agu-briefings.html. Ted Scambos, glaciologist, National Snow and Ice Data Center, University of Colorado, Boulder, Colorado. Bob Bindschadler, glaciologist, Goddard Earth Science and Technology Center at NASA's Goddard Space Flight Center, Greenbelt, Maryland. Michael Studinger, project scientist, Operation IceBridge, Goddard Earth Science and Technology Center at NASA's Goddard Space Flight Center, Greenbelt, Maryland. Reporters who are not attending the meeting may access press conference presentations via the Web. For instructions, visit https://www.agu.org/meetings/fm10/newsmedia/pressconference/. See NSIDC science at the AGU fall meeting for additional presentations of NSIDC research. Please contact the NSIDC Press Office at press@nsidc.org or +1 303.492.1497 with questions.